xi+241 pages with diagrams, index of openings and index of players. Royal octavo (9 1/2" x 6 1/4") issued in red cloth with gilt lettering to spine. Translated and edited by Harry Golombek and E Straus. First American edition. 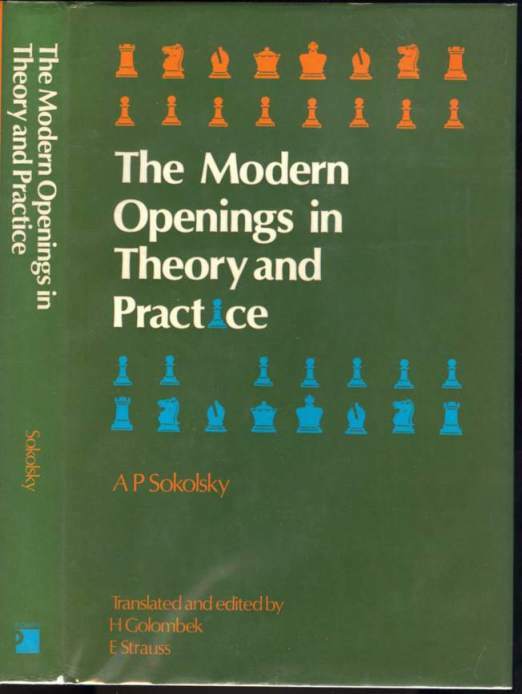 This major work of the famous Russian chess openings theorist Alexei Sokolsky, is distinguished by its original approach to the subject. Whereas other standard books deal with openings mainly in the form of lines and variations, analytical treatment. The effect of the openings on the game as it proceeds is explored and developed. Opening themes are shown to develop by a natural transition into plans for the middle-game and this is illustrated with copious examples from modern tournament practice. Especially valuable is Sokolsky's concentration on the influence and use of not only the central squares of the board but also those important squares that are contiguous to the center. He reveals how certain key openings are almost entirely concerned with the exploitation of those squares. He also provides a selection of miniature games which are chiefly to be enjoyed but which will also, of course, be immensely helpful in developing the player's opening game. Some occasional marginalia, tape stains to covers. Jacket light edge wear, price clipped else a very good copy in a very good to fine jacket.